Michael Richard Pompeo (born December 30, 1963) is an American politician. 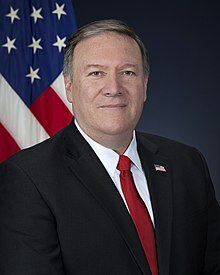 Pompeo is the 70th and current United States Secretary of State serving since April 2018. He was the Director of the Central Intelligence Agency from January 2017 to April 2018. He has been the U.S. Representative for Kansas's 4th congressional district from 2011 through 2017. He is a member of the Republican Party. He has also served as a Kansas representative on the Republican National Committee. On November 18, 2016, he was selected by President-elect Donald Trump to be Trump's nominee for Director of the Central Intelligence Agency. The United States senate confirmed his nomination and he assumed office on January 23, 2017. On March 13, 2018, Trump announced his intention to nominate Pompeo as the new United States Secretary of State, succeeding Rex Tillerson after March 31, 2018. On April 26, 2018, Pompeo was confirmed by the Senate in a 57–42 vote, and was sworn in the same day. Pompeo was born in Orange, California in 1963. He attended the U.S. Military Academy at West Point where he majored in Mechanical Engineering, graduating first in his class in 1986 and serving in the Regular Army as an Armor Branch cavalry officer from 1986 to 1991. He received his J.D. from Harvard Law School, where he was an editor of the Harvard Law Review. In the 2010 Kansas Republican primary for the 4th District Congressional seat, Pompeo defeated State Senator Jean Schodorf (who received 24%), Wichita businessman Wink Hartman (who received 23%), and small business owner Jim Anderson (who received 13%). In the general election, Pompeo defeated Democratic nominee State Representative Raj Goyle. Pompeo received 59% of the vote (117,171 votes), to 36% for Goyle (71,866). Pompeo has been on the Permanent Select Committee on Intelligence and Committee on Energy and Commerce, and the following 3 subcommittees: the Subcommittee on Commerce, Manufacturing and Trade, the Subcommittee on Energy and Power, and the Subcommittee on the CIA. He is also on the House Select Committee on the Events Surrounding the 2012 Terrorist Attack in Benghazi. On November 18, 2016, President Trump announced that he would nominate Pompeo to be the Director of the Central Intelligence Agency. On January 23, 2017, the United States senate approved of Pompeo's nomination and soon afterwards assumed the position of CIA Director replacing John O. Brennan. On March 13, 2018, President Trump fired Secretary of State Rex Tillerson and nominated Pompeo to replace him. During Easter weekend 2018, Pompeo visited North Korea and met with Supreme Leader Kim Jong-un to discuss the 2018 North Korea–United States summit between Kim and Donald Trump..
Pompeo was confirmed by the United States Senate on April 26, 2018 and sworn-in the next day by United States Supreme Court Justice Samuel Alito. In May 2018, Donald Trump greeted three American detainees that were released by Kim Jong-Un while Pompeo brought them back to the United States from North Korea. The next day, Trump announced on Twitter that he will meet Kim on June 12, 2018 in Singapore for peace talks. Pompeo is married to Susan Pompeo. They have one child together. They live in Wichita, Kansas. ↑ 2.0 2.1 Gerstein, Josh (January 12, 2017). "Who is Mike Pompeo". Politico. ↑ Sebastian, Michael (January 23, 2017). "12 Facts About Mike Pompeo, Trump's CIA Director". Cosmopolitan. ↑ Office of the President Elect and of the Vice President Elect (2016-11-18). "President-Elect Donald J. Trump Selects U.S. Senator Jeff Sessions for Attorney General, Lt. Gen. Michael Flynn as Assistant to the President for National Security Affairs and U.S. Rep. Mike Pompeo as Director of the Central Intelligence Agency". Press release. https://www.greatagain.gov/news/president-elect-donald-j-trump-selects-us-senator-jeff-sessions-attorney-general-lt-gen-michael.html. Retrieved 2016-11-18. ↑ 5.0 5.1 "Trump fires Tillerson as secretary of state". March 13, 2018 – via www.bbc.co.uk. ↑ Parker, Ashley; Rucker, Philip (2018-03-13). "Trump ousts Tillerson, will replace him as secretary of state with CIA chief Pompeo". Washington Post. ISSN 0190-8286. Retrieved 2018-03-13. ↑ Harris, Gardiner; Kaplan, Thomas (April 26, 2018). "Mike Pompeo, Confirmed as Secretary of State, Plans to Quickly Head to Europe". The New York Times. ISSN 0362-4331. Retrieved April 26, 2018. ↑ Jarlson, Gary (May 31, 1986). "Santa Ana Cadet Wins Top West Point Honor". Los Angeles Times. Retrieved December 5, 2016. ↑ Lefler, Dion; Ron Sylvester (2010-08-03). "Pompeo, Goyle to Meet in 4th District race". Wichita Eagle. Retrieved 2010-08-04. Republican National Committeeman Mike Pompeo survived a bruising GOP primary and Rep. Raj Goyle of Wichita steamrolled his Democratic opponent to set up the general election battle in the Kansas 4th Congressional District. ↑ "House Results Map". The New York Times. Retrieved September 24, 2015. ↑ Lowry, Bryan (2014-05-09). "Rep. Mike Pompeo appointed to Benghazi investigation committee". Kansas.com. Retrieved 2016-07-24. ↑ "President-Elect Donald J. Trump Selects U.S. Senator Jeff Sessions for Attorney General, Lt. Gen. Michael Flynn as Assistant to the President for National Security Affairs and U.S. Rep. Mike Pompeo as Director of the Central Intelligence Agency". President Elect Donald J. Trump. Retrieved November 18, 2016. ↑ Harris, Shane; Leonnig, Carol; Jaffe, Greg; Nakamura, David (April 17, 2018). "CIA Director Pompeo met with North Korean leader Kim Jong Un over Easter weekend". The Washington Post. Retrieved April 17, 2018. ↑ Fox, Lauren; Walsh, Deirdre; Koran, Laura (April 26, 2018). "Mike Pompeo sworn in as Trump's second secretary of state". CNN. Retrieved 2018-04-26. This page was last changed on 18 February 2019, at 19:08.